Celebrating the Bilingual Child Month – Giveaway & Discounts Extended! Celebrating the Bilingual Child Month is a great opportunity to recognize the many children who speak two or more languages and understand multiple cultures. Let’s encourage literacy and parental involvement, and celebrate the children who work so hard to learn a new language. Huge Bilingual Book Giveaway – Extended! Language Lizard has given away a surprise set of bilingual books to a new winner every month. We’ve already given away OVER $1,000 in bilingual books! In the spirit of Celebrating the Bilingual Child Month, we’re extending our huge Bilingual Book Giveaway through the end of 2018! New winners are selected every month, so enter today for a chance to win a surprise set of bilingual books in your choice of languages! Discounts on all Bilingual Book Sets in over 50 languages! 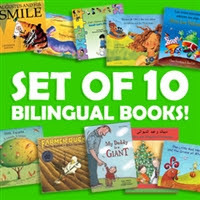 We’re also extending our discount on all Bilingual Book Sets. No code needed! We hand-selected our most popular books to save you time and money. These book sets will help you choose the most accessible, interesting, and culturally appropriate books for your little language learners. Today’s spotlight language is Farsi. Find background information and interesting facts about the language, as well as information to help you find Farsi children’s books. Interested in learning about even more languages? Check out our series of posts on world languages, including French, Hindi, Russian and Japanese! Farsi, also known as Persian, Dari or Tajiki, is the national language of Iran, Afghanistan, and Tajikistan. It is also spoken in other parts of the Middle East and India. There are around 60 to 80 million native speakers around the world. How Many People Speak Farsi in the US? According to the most recent US Census data, there are about 400,000 people who speak Farsi in the US. There are large Farsi speaking populations in California, New York, and Washington, DC. In Farsi, nouns have no gender, and there are no articles. Farsi is considered to have a relatively simple grammatical structure. The first handwritten book in Farsi was a medical book written in 1055. If the kids in your life speak Farsi , or are learning the language, you may want suggestions on some of the best bilingual Farsi books and audio books for kids. Some culturally relevant stories with text in both English and the Farsi language include: Journey Through Islamic Arts, The Swirling Hijaab and Samira’s Eid. Other engaging story books include Goldilocks and the Three Bears, Pandora’s Box, and The Giant Turnip. You may also want to check out the illustrated Farsi-English dictionary with audio for children. Do you speak Farsi, or are you learning the language? Comment below and share your interesting language facts! New Bilingual Children’s Books Available!